This post continues the discussion of the previous post on random walks. The previous post looks at random walks graphically. This post introduces the notion of random walks more formally. Consider , which is a sequence of random variables indexed by the non-negative integers. By definition this is a stochastic process, to be precise a discrete stochastic process since the random variables are indexed by integers. The integers in the subscripts can be interpreted as time. Thus the random variables describe the states of some process over time. The stochastic processes discussed in the previous post, the future state of the process is obtained by adding one (with probability ) or subtracting one (with probability ) to the current state . So a given state of the process is one higher or lower than the state in the previous period. The random walks in the previous post go up or down with equal chance, i.e. . The following graph is from the previous post, which shows 5 simulations of such random walks. We now give a more general description of the random walk. Instead of a random one-unit up or down move, the moves in the random walk are determined by a predetermined discrete distribution. Let be integer-valued random variables that are independent and identically distributed. Let be the common probability function. Let be an integer-valued random variable that is independent of the random variables . The random variable will be the initial position of the random walk. The random variables are the increments (they are the amounts added to the stochastic process as time increases). For , define . Then is called a random walk. Wherever the process is at any given time, the next step in the process is always a walk in a distance and direction that is dictated by the independent random variables . For convenience, we will call the random variables the increments in the random walk since they tell the process how far (and what direction) to walk in the next step. The state space is the set of all the values that can be taken on by the random variables . In this case, the state space is either the set of all integers or the set of all non-negative integers or some appropriate subset of or . Given the current state of the process , the next state is obtained by adding the random value to the previous state . If the random variables are independent Bernoulli variables with and . Then each state is the result of an up or down move by one unit from the previous state. The examples in the previous post are based on this type of Bernoulli one-unit up and down move. In the general definition, the future state , instead of being adjusted by a uniform up or down adjustment, is adjusted by the random variable . One important task is to establish the probabilities of the transition from one state to another. For example, if the process is currently in state , what is the probability that it will be in state in the next period? More specifically, given that the random walk is in state , i.e. , what is the probability that the process in in state in the next period, i.e. ? Such probabilities are called one-step transition probabilities. The probabilities that we wish to obtain are for . Recall that is the common probability function for the random variables . Given states , define . The number is the probability of the process transitioning from state to state in one step, which is evaluated based on the common probability function of the increments . Now that we know the probability of the process going one state to another state in one step, other probability questions are: what is the probability of a path and what is the probability of going from state to state in steps? The probabilities in the second question are called -step transition probabilities. The probability of a path is discussed here. The -step transition probabilities are discussed here. Conditional on the initial state , the probability of the process going through the path is simply the product of the one-step transition probabilities. Note that the transition probabilities and the probabilities of paths are independent of the current period . Random walks with such property are called time-homogeneous or stationary. 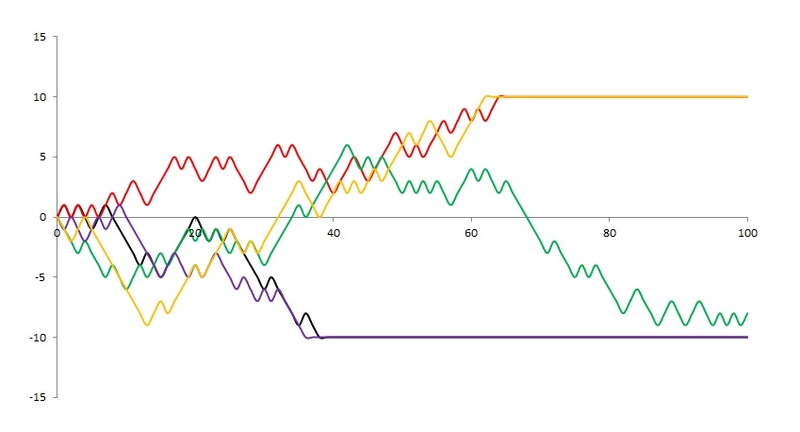 Thus the probability of transitioning into state from state or the probability of transitioning through a path is identical regardless of where the process is in the time scale (at the beginning in the process or later in the process). This random walk has three moves at any given state, an up move by one unit, a down move by one unit and a possibility that the process stays at the same state. Of course, the possibility for modeling is limitless. We can use other distributions for the common distribution of the increments , e.g. binomial distribution, Poisson, preferably having these distributions shifted in order to account for up moves and down moves. The random walks discussed above potentially have an infinite state space, i.e. the process can potentially reach far from the initial state without bounds. Depending on the common distribution of the increments , the process can go up indefinitely to or go down to . The random walks in Figure 1 have increments 1 and -1 and can reach states that are arbitrarily high or low, though it would take a great many steps to reach such high levels. Any random walk with unbounded state space can be modified to have a finite state space. Pick two states that serve as boundaries, one lower and one upper. The states in between the boundary states are called interior states. Whenever the process reaches the upper boundary or the lower boundary, the process either stays there and not move any further or transition back into an interior state. The transition probabilities in the interior states remain the same as discussed above. If a boundary state is such that the process always stays there after reaching it, it is called an absorbing state. A handy example of a finite-state random walk is the gambler’s ruin. Suppose that a gambler starts out with units in capital (in dollars or other monetary units) and makes a series of one-unit bets against the house. 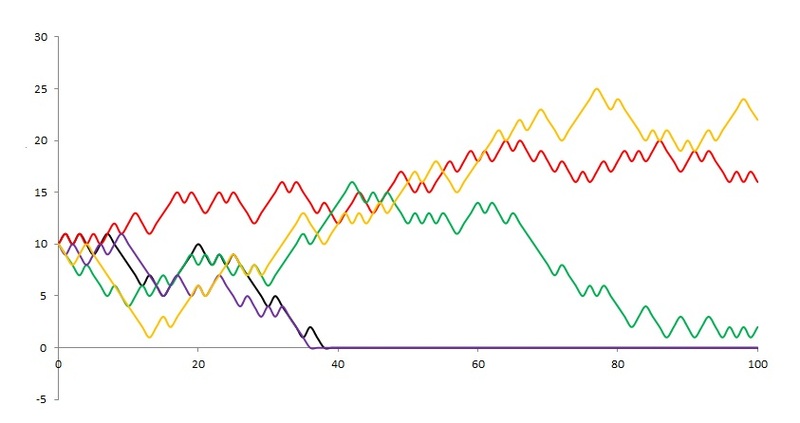 For the gambler, the probabilities of winning and losing each bet are and , respectively. Whenever the capital reaches zero, the gambler is in ruin and his capital remains zero thereafter. On the other hand, if the capital of the gambler increases to where , then the gambler quits playing. Let be the capital of the gambler after the th bet. Then is a random walk. The starting state is . The states and are absorbing states. The following gives the transition probabilities. A random walk is a stochastic process such that at each time point, the process walks a certain distance that is dictated by an independent and identically distributed sequence of random variables. In such a stochastic process, the future state depends only on the preceding state and not on the past states before the preceding state. 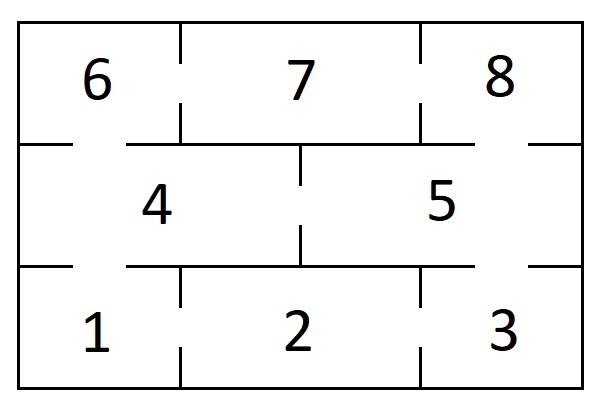 For example, in the gambler’s ruin, the gambler’s capital at any given point depends only on the his capital in the previous play. In a stochastic process , the property that the future state depends only on the preceding state and not on the past states is called the Markov property. Any stochastic process with the Markov property is called a Markov chain. A random walk is a Markov chain. There are Markov chains that are not random walk. The notion of Markov chains is introduced in this post. A stochastic process is a sequence of random variables . Since the random variables are indexed by the integers, this is a discrete stochastic process. The integers in the subscripts can also be interpreted as time. Suppose is the random value taken on by the process at time 0. Then is the random value taken on by the physical process at time 1 and so on. The notion of stochastic processes will be examined in more details in subsequent posts. This post looks at plots of some simple random walks, a particular type of stochastic processes. The next post gives a more formal definition of random walks. One type of stochastic processes is a random walk, which can be regarded as a sequence of random steps (up or down for example) on some mathematical spaces such as the integers. For example, assume that is an integer (the initial position of the walk) and further assume that it is equally likely that is either or . Then is an example of a random walk. A colorful way to describe this random walk is that a drunkard takes steps along a path at random by taking one step to the left or one step to the right with equal chance. For convenience, we can assume that the initial position is (the origin). To demonstrate the random nature of the walk, we simulate such a random walk five times using random numbers generated by the function =Rand() in Excel. All 5 examples of the walk starts with . One hundred steps are shown for each random walk. Each random move is basically the result of a coin toss. If the toss is a head, the step is to the right, which means adding one to the previous position (in the graph the path would go up by one step). If the coin toss is a tail, the step is to the left, which means subtracting one to the previous position (the graph would go down one step). It is clear that the positions of the drunkard are initially close to the origin but as time goes by the drunkard may be far from the origin (either to the left or to the right). At the end of the 100 moves, the drunkard is about 10-12 steps from either side of the origin. For each random walk in Figure 1, the random moves to the left or to the right (up or down in the plot) are generated using the function =Rand() in Excel. The following are the first 10 random values for the random walk in red in Figure 1. If a random value is less than 0.5, we take that as a tail and if it is more than 0.5, we take that as a head. With , the next 10 positions are 1, 0, 1, 0, 1, 0, 1, 2, 1, 2. The random walks in Figure 1 have no restriction. The random variables can take on both positive and negative integers without bounds. The set of all values that can be taken by the random variables in the random walk is called the state space. So in these examples, the state space is , the set of all integers. The random walks in Figure 1 have finite versions, i.e. the state space is a finite set. For example, the path the drunkard is on has barriers at both ends (10 steps away from the origin at either end). Whenever the drunkard reach 10 or -10, he stops. For example, his house is at step 10 and a bar is at step -10. Whenever he reaches the house or the bar, he stays there. The following is a graph of the same random walks with the 10-step limitatons. Note that when the process reaches 10 or -10, it stays there from that point on. Such states are called absorbing states. The random walks in Figure 2 have two absorbing states 10 and -10. With minor adjustments, these random walks have a gambling interpretation. Suppose that a gambler starts out with units in capital (in dollars or other monetary units) and makes a series of one-unit bets against the house. 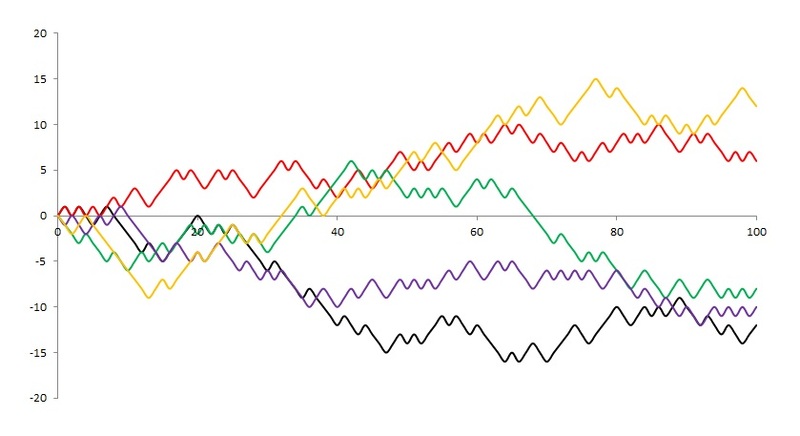 For the gambler, the probabilities of winning and losing each bet are and , respectively. Whenever the capital reaches zero, the gambler is in ruin and his capital remains zero thereafter. On the other hand, if the capital of the gambler increases to where , then the gambler quits playing. Let be the capital of the gambler after the th bet. Then is a random walk. The starting state is . The states and are absorbing states. Note the similarity between the random walk that describes the gambler’s ruin and the random walks in Figure 2. 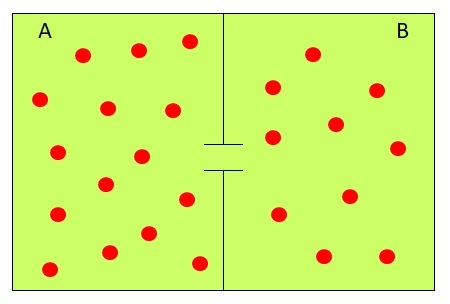 In gambler’s ruin, the capital is increased or decreased by one unit at random (probability for an increase and probability for a decrease). Whenever the process reaches 0, it stays at 0 thereafter (the gambler is in ruin and he stops playing). Similarly, whenever the process reaches , the process remains at (the gambler reaches his goals and stops playing). The following is a graph of five simulations (100 plays each) with starting capital 10 units ( ) and maximum target 100 units ( ). Note the similarity in shapes between Figure 2 and Figure 3. The 100 random moves in Figure 3 are obtained by the same random numbers behind the random walks in Figure 2. Two of the simulations end in ruin (the purple at 36th play and the black at 38th play) fairly early in the process. At the end of 100 plays, the other three simulations are not yet in ruin, even though the random walk in green appears to be close to be in ruin. Let’s extend the random walks up to 500 plays of the gambling games. In all 500 plays of the game, no random walks have reached the maximum target of 100 units. In fact, the gambler is in ruin in four of the simulations, the purple and the black mentioned earlier along with the green and the red. The yellow random walk will likely be in ruin too if the game continues. An alternative interpretation of the gambler’s ruin random walk is this. 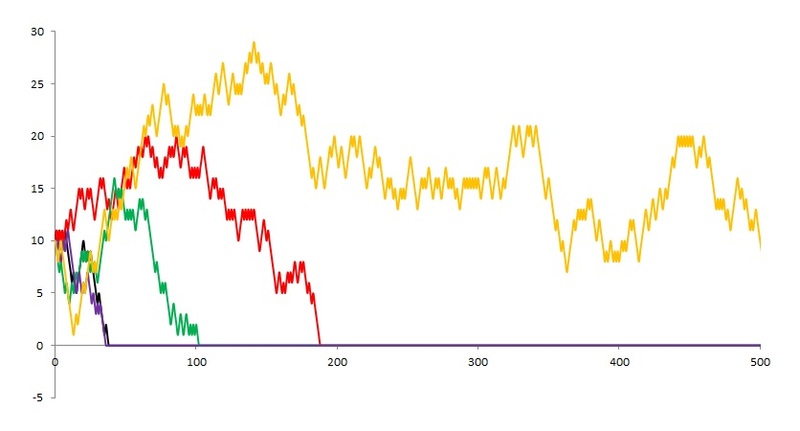 Assume that two players make a series of one-unit bets against each other and that the total capital between the two players is units with the first player having units in capital. Further suppose that the first player has probability of winning a bet and the second player has probability of winning a bet. Then the two gamblers play until one of them goes broke (is in ruin). Let be the capital of the first player after the th play. Then is the same random walk demonstrated in Figure 3 and Figure 4. In Figures 3 and 4, the initial capital of the first player is 10 units and the total capital of the two players is 100 units. The probability of the first player winning all 100 units is 10/100 = 0.10 (see this post on gambler’s ruin). In other words, there is a 90% chance for the first player going broke! Whenever the gambler’s capital is small and is dwarfed by the other player (e.g. a casino), the probability of ruin for the gambler is all by certain. The 90% chance of ruin is based on the bets being even bets, which is not the case in the casino. Thus being in ruin in casino games is even more of a certainty. For a stochastic process in general, there is no additional assumption on the random variables . We can assume that are independent random variables. However, the independence assumption may not be realistic. In many applications, the future states may be dependent on the past and current states. Note that in the random walk examples discussed in this post, the future state is dependent on the preceding state . In the gambler’s ruin example, the future capital is always one unit above or below the capital of the previous period. In the drunkard’s random walk, the future position is always one step to the left or to the right of the previous position. The past position preceding the immediately preceding period do not influence the future state. The examples discussed in this post are excellent beginning examples to illustrate the stochastic processes in which the future state depends only on the preceding state and in which the past states do not influence the future states. This property is called the Markov property. Any stochastic process with the Markov property is called a Markov chain. A random walk is an example of a Markov chain. Random walks are discussed further in the next post. The notion of Markov chains is introduced in this post.